Motor will stop rotate much faster than using only the mechanical switch, thanks to the fly-back diode. As a result, when shooting in single shot mode, spring will remain uncompressed after shooting, reducing stress and wear in your gearbox. There will be no more current flowing in your mechanical switch, switching action will occur in the mosfet component, this will dramatically increase life shelf of you switch. Mosfet switch are far more efficient than mechanical system, you will feel the difference. 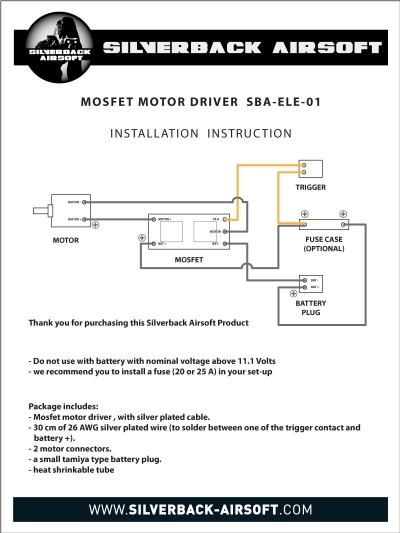 The Silverback Mosfet Motor Driver have a minimal resistance, motor will receive more power, leading to an increased rate of fire. IR Mosfet, ST Microelectronic Fly-Back Diode, custom design PCB, pre-soldered silver plated copper wire for low resistivity (with Teflon coating), 20cm length (should be enough for assembly on most of the available aeg). 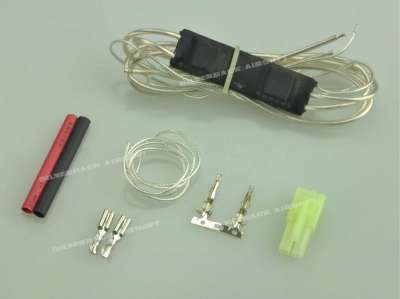 Provided with Heat shrinkable tube, motor connectors and battery plug. /! For use with battery with nominal voltage equal or below 11.1 Volts /!